On June 25th pop music reporter Jim Derogatis of Vocalo.org broke a story about Illinois Attorney General Lisa Madigan investigating the radius clause imposed on bands who play Lollapalooza and the festival’s possible anti-trust violating relationship with the City of Chicago. Then on June 30th, Derogatis followed up the story with a series of key questions that probe deeper into Madigan’s motivation, Chicago’s live music community response and why some have chosen to remain silent. But the question we’d like to ask is, does any of this really impact concert fans? And, more importantly, do concert fans even care? Well, it’s good to see that Jim Derogatis didn’t waste anytime breaking big news at his new gig at Vocalo.org. And it’s really no big surprise since he’s got a history of delivering this sort of investigative music biz reporting. And the reason I’m sharing it with you is because the news that Derogatis broke does impact concert fans. I’m not going to re-post everything that Dero reported, but I will share with you a few of the questions he posed. And then we’ll pose a few questions of our own because what Dero says brings up an ongoing topic of manipulation all concerts fans have faced since the Live Nation and Ticketmaster merger back in January. As I mentioned in the intro, Derogatis broke a story about Illinois Attorney General Lisa Madigan investigating the details of Lollapalooza’s radius clauses. 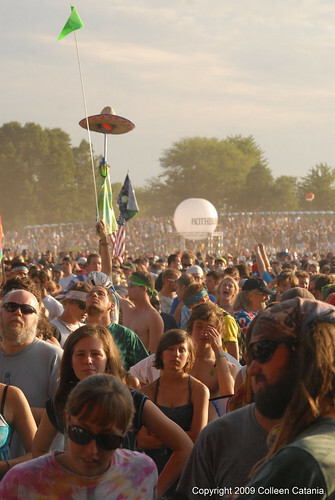 Yes, radius clauses are nothing new to concert promoters or the concert industry, but as Derogatis points out, the relationship between Lollapalooza, C3 present (Lollapalooza’s promoter) and the Parkways foundation ( the Chicago park’s program that has partnered with Lolllapalooza) does bring up anti-trust issues and a lot of other questions. Following his original breaking news story Dero asked a series of questions about the Madigan investigation and included interviews with key players in the situation such as Chicago venue owners and promoters. Though I don’t always agree with him, Dero’s has been one of my respected and go-to music reporters because he does report stories like these. And this radius clause story is yet again a solid piece of reporting. I encourage you to read both stories, and to give you a small sampling of what got the live music community all jazzed up these last few weeks, I listed below a few of the questions that Dero asks. You should take the time to think about them and decide what they mean to you because all the questions Dero’s asks are vitally important to the live concert experience. Is the investigation just about the radius clauses? And are they really that big of deal? Is the investigation an outgrowth of a turf war between rival concert promoters Jam Productions and Lollapalooza’s C3 Presents? Beyond the story itself, it’s good to see both the fans and Dero get involved in the comments by expressing their opinions and asking more questions. And because of that, I suggest checking out the comments on both of Dero’s reports since they flesh out the impact, background and reasoning behind the radius clauses. Adding more insight to the story, Chicago Tribune’s Greg Kot posted his analysis of the situation and reported on how other music festivals like Coachella use radius clauses. Here’s a snippet from a post written by music business attorney Zachary Cincotta who wrote about how the legal details impact the Lollapalooza radius clause story. But is this standard music industry practice an antitrust violation or just good business sense on the part of the venue? Well, here’s the deal – the US antitrust laws, namely the Sherman Act and the Clayton Act, prevent unreasonable restraints on trade. Many state courts throughout the years have noted that radius clauses, typically those found in shopping center leases, are restraints on trade, albeit ones which protect the venue’s (if not the bands’) legitimate business interests. Therefore, courts tend to weigh, on a case by case basis, the scope and reasonableness of each radius clause to ensure that they are no broader than necessary to protect those legitimate business interests. Courts have a lot of balancing tests and equations for all of this, but basically it comes down to whether the court thinks the particular radius agreement is reasonable in light of the circumstances. Courts sometimes go so far as reform or rewrite a radius agreement rather than declaring the entire thing illegal; for example, a clause preventing a band from playing a 100 mile radius for 6 months could be revised to only prevent the band from playing within a particular city for, say, two months. To get more info on what radius clauses are you can also check out this article from Music Biz Advice. Do Fans Really Care? Or Are You Caught In the Middle Like Helpless Pawns Again? The more I think about the radius clause situation from the fan perspective, the more I think of how it’s just like what happened in the wake of the Live Nation and Ticketmaster merger. Meaning, when the merger was announced most fans responded with a silent “who cares, what can we really do” sigh. And in the wake of the fans collective silence, I started to wonder if fans like, or even find pleasure in, being manipulated. For me, I’m thinking along the same lines as Time Out writer Brent DiCrescenzo, who in his radius clause article asked the question if the radius clause even matters. Brent mostly came from the perspective of the bands, and I’d like to take it one step further and ask, again, if the FANS REALLY DO CARE. Do you feel like a powerless pawn in the big game that’s being played between the concert promoters, the bands, the media and the local government? Do you feel like your being manipulated? What say you valuable and honored live music fan? Do you side with the promoters? The bands? Neither? Do you plead the fifth? Yes, it’s a tough choice. But at the very least, we should all take time to think about the impact of radius clauses.